Are you living in a dorm room with little more than a hot plate to cook with? Tired of Ramen Noodles or Hamburger Helper night after night? Whole chicken in a can will liven up your cuisine and introduce you to a whole new world of flavor. Shelf stable, it needs no refrigeration. Non-perishable, it will remain good on the shelf until the can is opened. This could be years, not months. Smaller portion, means no leftovers that need refrigeration. Fully cooked, so all you need to do is reheat it. Whole chicken in a can is great for college students trying to get by on a tight budget. With nothing more than a pot on a hot plate you can create delicious and nutritious soups and stews. The broth is included, just empty the can into a pot. After simmering for a bit, remove the bones. This will be easy because the meat is fully cooked right out of the can. Add water, vegetables, and a few spices. After simmering a while longer, you have a good hearty supper. Could anything be easier? I bet your neighbors will be knocking on your door looking for the source of the homecooked smells drifting through the building. Whole canned chicken is also great to take along on camping trips, or as part of your emergency evacuation food supply. It’s also a great way to create recipes from ingredients you happen to have on hand. 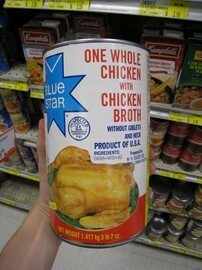 With just a little imagination you can actually enjoy an appetizing meal with whole chicken in a can.